Keller by Kinderkram, imported from Germany. Wonderful toys created by Keller from Germany. Keller has been a household name in Europe for many generations and with good reason. These are beautiful and high quality wooden toys unlike any other. Most of these wooden toys have been awared with the European "Spiel Gut", "Play Good" award, and are searched for by children (and collectors) world wide. 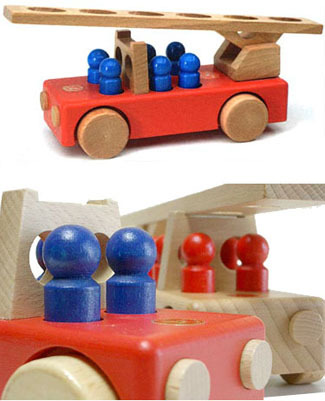 These beautiful wooden toys stimulate and train children's motor skills. They have a fun and easy-to-grasp shape, perfect for the hands of a small child! Unlike other mass-produced plastic toys, the beautiful Keller toy line comes minus the distracting bells and whistles, so it's just Junior cruising along the wide open road of his imagination (which was really the point anyway).